Sarahah is a free anonymous messenger app developed by a ZainAlabdin Tawfiq, a Saudi Arabian developer. It runs on IOS and Android 4.4+ OS running mobile devices. It is a tiny app. The size of the application’s APK file is 5 megabytes. The Sarahah app has been published on the Google Play Store and Apple App Store. It doesn’t run on older version of the Android or IOS OS. If Sarahah is compatible with your device, install the app and tap on its home screen icon to run it. New users must register a new account to use Sarahah. Registration is quick and easy. During the registration process, the app asks you to enter your name, password, a username. It doesn’t prompt you to verify the email address. Existing users must log in to the app to use it. Sarahah app employs a light color theme for its interface. The main interface of this application features a bottom navigation bar, which boasts four tabs – Inbox, Search, Explore, and Profile. The Inbox is divided into three sections – sent, received, and favorite. Messages you send to other users will appear under the Inbox tab. To see the list of messages other users have sent to you, tap on the Received tab. Sarahah allows users to bookmark messages they like or find interesting. Bookmarked messages appear in the Favorites section of the app. 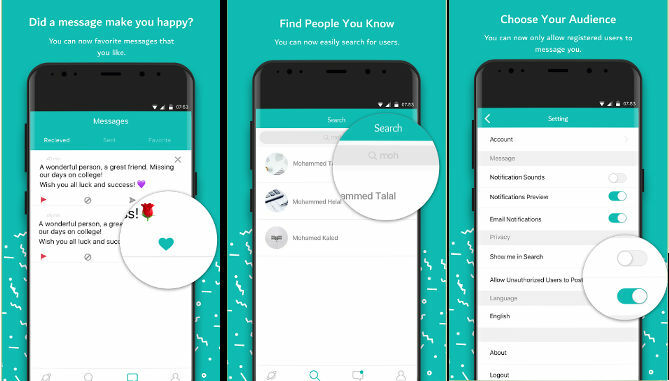 Sarahah app provides a search option for finding friends. To find your friend, enter his/her name in the search box. When you do so, Sarahah will display a list of profiles matching the name you’ve entered in the box. Unfortunately, you cannot visit users profile and see their wall. The only thing that helps you in identifying a person on Sarahah is the profile picture. If the list is big, you’ll end up spending several minutes in finding your friend’s profile. The profile interface boasts a link and an option to upload the display picture. To receive messages, you must share your Sarahah profile with friends on Facebook, WhatsApp, Twitter, Instagram and other major social networks/messaging apps. Sarahah app features a settings section where you’ll find options to prevent the app from displaying your profile in search results, disable/enable notifications, etc. Well, there’s no guarantee that your friends will comment on your Sarahah wall. One of my Facebook friends has 400+ connections. He shared his Sarahah profile on FB wall. To his dismay, only 4 friends left their honest feedback on his Sarahah wall. Sarahah has made it to the list of top 10 trending apps on iTunes and the Play Store. But the big question is, how many people are using Sarahah on daily basis? Did the 10 million users receive honest feedback from their friends? The app may have become viral because users are forced to share their Sarahah profile on large social networks. When you share a website or Google Play Store URL on social networks, 1 out of 10 people who see the link in their news feed will visit the web page or download the app. Sarahah app allows you to write brief reviews of human beings. It is free and has ordinary features.